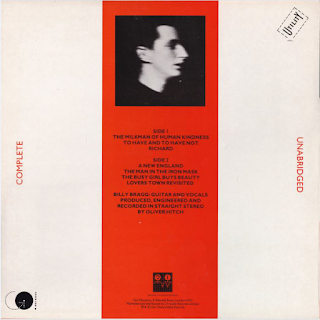 This was actually just a seven track extended EP, lasting just sixteen minutes of ex-soldier Billy Bragg, who nobody knew anything about at the time, and his clashing, reverb-soaked electric guitar and un-reconstructed Essex, glottal-stop droning voice. Never mind the voice, which admittedly is an acquired taste, he had a commitment and political honest morality that was admirable, to me, anyway. He had a Clash-like punk ethic and an articulate, intelligent and thoroughly unpretentious anger. He wasn't merely a fist-pumping tub thumper but he had a message to get across and he was going to use his Woody Guthrie-inspired travelling troubadour persona to do it. The musical backing would develop on later albums, but here it was just the man and his guitar. It is raw, edgy, lo-fi and very "alternative". Very home produced. Therein lies its appeal, however. These songs were almost like demos for the sort of material that would be given better musical backing on later albums. Politics are never far from the surface, of course, but it doesn't tell the whole story. It was often overlooked at the beginning that Bragg could also pen a sensitive lyric too, as a song like the evocative "The Milkman Of Human Kindness" proves. "To Have And Have Not" is about getting qualifications and trying to avoid the social inequality between rich and poor. He already had his finger on the pulse regarding the university of hard knocks. "At 21 you're on top of the scrapheap, at 16 you were top of the class". He also questions own political persona with disarming honesty. Nobody does little vignettes and characterisation of ordinary people quite like Billy Bragg. His songs are full of characters that we have all known. "Richard" is one of them. Another delightful little social sketch is the atmospheric, cynically moving "A New England". "I love you then as I love you still, I put you on a pedestal, they put you on the pill...". Bragg delivers these words mournfully yet sensitively as he gazes off into the distance into the wet night streets over the top of his beer. "I don't want to change the world, I'm not looking for a New England". I'm just looking for another girl." Absolute classic Billy Bragg. "The Man In The Iron Mask" is a brooding, stark typically Bragg love song. It is mysterious and haunting, showing that Bragg had a talent for writing this sort of song. "The Busy Girl Buys Beauty" has Billy exploring his frustration with the (in his opinion) vacuous lives of some older teenage girls as they move into womanhood. I can't help but feel it is just a little patronising though. "Lovers Town Revisited" is one of the best songs on the album, a short, sharp tale of trouble outside nightclubs. 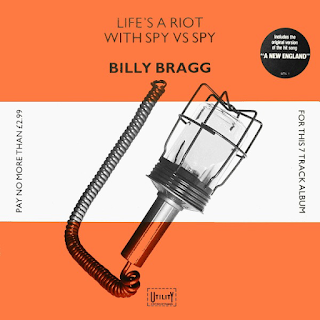 While this was a hard-hitting introduction to the music and lyrics of Billy Bragg, for me, there was much better to come.